Despite making my own homemade baby food, Skylar just isn’t into it yet. So I turned to Sprout Foods, co-founded by chef (and dad of 3) Tyler Florence. Our time at the Food Network overlapped a little, but we never met (I worked there in production from 1994- 1999). Now that Skylar is old enough to eat, we just had to sample some! So far, my little guy is partial to the Sweet Peas and Garden Green Beans. 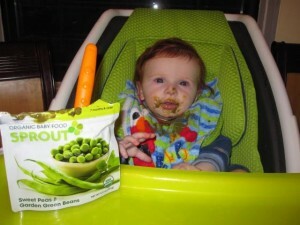 This puree was bright green (and matched our Mamas and Papas Loop High Chair). Skylar loved it. We also sampled and liked the Roasted Bananas & Brown Rice flavor (yum), Roasted Pears & Apricots, and a few other types. We give Sprout a big thumbs up! I loved that it’s organic and a little more exotic than I would think to make (like adding mint to peas and green beans). The pouches shouldn’t go in the trash – they can be sent to TerraCycle to be upcycled into new pouches. Go to http://www.terracycle.net for more info. Click here for Sprout coupons. Thank you to Sprout Food for providing product samples.